It is typical of the year that has seen one of the most prolonged and serious droughts in living memory that the final weekend and day of the fishing should end with a large flood and brown water making the river virtually unfishable. more severe drought than the previous year. However, when the drought broke and there was water in the river, there were plenty of fish to catch. There have been some spectacular weeks fishing, albeit later in the season. The success of the season was when Andreas Ennemoser managed to catch 3 salmon on Ballogie on his first day of fishing. Although the river is full of water now, the ground is still very dry underneath and it will need a good snow cover and slow melt this coming winter to properly fill the catchment’s natural reservoirs. Carlogie finished on 148 salmon and grilse, which is more than the 2017 total and not far short of the 5-year average. Although the catches for February, March and April were disappointing, they were in line with recent years and from May through to the end of the season, our catches have been in line with the 5-year average. The 42 salmon caught in September is considerably better than the catches for the last 5 years. A great catch of 36 sea-trout in June means that Carlogie in 2018 had 63 sea-trout against a 5-year average of 41 and recorded by far the best performance in the last 5 years. I am delighted that once again we have managed to finish just ahead of our rivals Dess. When the water is low and the width of the river and also the length of the pools becomes constricted it is inevitable that there is irritation, when one of the opposition manages to get into a pool first. We are still suffering from the negative effects of Storm Frank and it is hoped that over a period of time the river will start to shift some of the shingle which has, in recent years, restricted the amount of fishing. It is unfortunate because, in effect, we have 3 different beats fishing against us and therefore there are considerably more rods on the other bank. I thank you all for your forbearance on this issue and we just hope that we have plenty of water in the river next year. Ballogie has done very well to finish up with 150 salmon and grilse. As a largely high river beat, it has suffered proportionately from the drought conditions. However, the total is way above the 2015 total. It is good that the beat finished very strongly with a total of 55 salmon in September against a 5-year average of 34 for the month. A total sea-trout catch of 39 has been disappointing and reflects a difficult year in the crucial summer months. The cold start to the season and the dry weather did the Commonty no favours. When the early fish moved up, it has been difficult to hold fish on the beat. However, there was a very good performance in April with 16 fish caught, much better than any of the previous 5 years and a good showing in September as well. However, in August ,which over the last 5 years and more has been very productive, it was a poor performance with only 5 salmon caught. We have had a lot of new rods to the Commonty, who have enjoyed the fishing and particularly enjoyed the company and help of Ian Fraser. I have to say a massive thanks to Ian Fraser who came to Ballogie on his father’s death over 40 years ago and in a whole range of ways has given unstinting service to the Estate. Latterly, of course, he has been much appreciated as and has thoroughly enjoyed being, the Ghillie, on the Commonty. Although this season marks the end of Ian’s full-time employment with the Estate, I am glad to say that he will continue to be the seasonal ghillie on the Commonty and will provide ghillieing services through the spring months as previously. So we will hang on to Ian for a while yet, but it is an appropriate moment to recognise his lengthy and loyal service to Ballogie. I would like to thank all guests, particularly those of you who lead and organise groups coming to fish on the river, for your cooperation with the new booking system. It is much appreciated when payments are made in time, because that does help us to keep the administrative costs down. We are now setting prices a year in advance, to enable certainty of reservation of both fishing and cottages. There will be no increase in prices for Spring and Summer fishing for the 2020 season. The new Conservation Code for 2019 is attached to this letter. The Conservation Code used to be a wonderfully straightforward and simple document. Through the years, like so many similar documents, it has become much more complex, largely as a result of Government regulation. However, there are no significant changes for 2019. Some people have questioned whether the River should have been closed at the height of the drought this year. 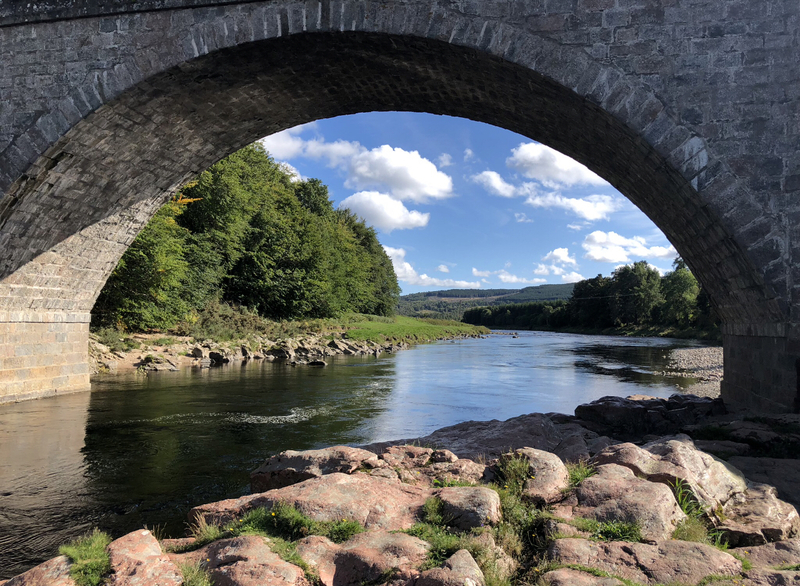 The Dee Board does not have the authority, in its own right, to close the River and would have to apply to the relevant Minister in the Scottish Government for a closure. By the time the application had been made, by the time Civil Servants had been consulted, by the time the relevant Minister could have made a decision, it is highly likely that the conditions on the River would have changed. I think that the issue is largely self-regulatory in that during the heat of the day, there is going to be very little chance of catching salmon and therefore nobody is likely to be fishing at this time, when catching a salmon might cause extra stress. Underall conditionsplease consider the safe handling of fish and to see that the fish is out of the water for the absolute minimal time. If you have any questions about handling fish please talk to the ghillies, when you arrive at the start of next season or look at the “Gift” video on the www.Riverdee.org website. There you will also find a photo of Jacob Oliver, who was the 2017 Callum Mackenzie Cup Winner. He and his dad had a free day fishing on the Commonty. Thank you for the contribution made through the rod levy to the work of the RDT. Last Spring a cheque for £1933 was sent to the Trust and this Spring the donation will be over £2000. This support is really appreciated and normally can be used to match fund projects, so doubling the value of the donation. The Trust’s key project is the radio tracking of smolts. This project has given scientific basis to quantify the smolt loss within the catchment. The Trust has an important educational role to encourage a younger generation to be interested in the river and fishing. Many of you have enjoyed the facilities and service at the Café. If you wish, it is possible to provide fishers’ lunches for pick-up at the Café and also we can provide meals in the evening outside the normal times provided it is a large enough a party and that the booking is made in advance. If you would like to book evening meals, or to have a meal ready on your arrival after your journey, please ring or send an email. Tel: 013398 84468 or Potarch@ballogie-estate.co.uk. Because of the popularity of our cottages, particularly Potarch Lodge, with wedding guests, we have developed a new luxury self-catering house in part of Balnacraig, where Christina and I live. The East Wing itself has 3 double bedrooms, but upon request we can provide additional accommodation in the main part of Balnacraig House. Balnacraig is an historic 18thCentury house and has unique position looking out over Ballogie and the Birse beats of the river. It has been done up to the same standard and style as Potarch Lodge. When talking about self-catering please can I request that if you have taken Ford Cottage along with the Carlogie fishing, can you try and see that the crockery and plates that belong to the Calm Hut are returned at the end of your stay. It remarkable how much time is spent putting cutlery and crockery back in the right place. Your assistance with this would be much appreciated. Many of you come to Deeside and enjoy the wonderful drive over the Cairn O’Mounth and down through Glen Dye. I am very sad to have to say that Glen Dye Estate and an energy company called Cariolis are planning a large windfarm on the Cairn O’Mounth. This is for 26 x 150m high wind turbines on the west side of the Cairn O’Mounth right in the middle of that iconic view from the Cairn through to Lochnagar. It is not merely the turbines, but some 30km of tracks required to erect and service the installation and also the electricity pylons. For me that rise at the top of the Cairn and that view looking over Deeside is the gateway to Deeside and I am sure that many of you will feel that putting a windfarm in this location on peat hill, hardly makes any sense environmentally, socially or even questionably economically. If you wish to lodge a protest against the development, please e mail Alex Burnett or Mike Rumbles, our local MSPs, because this is a national planning matter and is not decided at local government level. I would like to thank, once again, Sean and Ian for their enthusiasm and the great service that they have given through this particularly difficult year and also Jean for her continued support and for arranging all your requirements both for fishing and holiday cottages. 2018 has been a difficult and challenging year throughout the salmon fishing world in north-west Europe. Whatever 2019 will bring, it will be different for certain. Thank you for your continued support and we look forward to welcoming you back again next year.